I have tried almost every kind of drugstore product out there during the past 10 years of my life, and have moved on to department store products and have noticed a huge difference in my skin. To remove makeup: Bioderma, which is by far the best makeup remover I have ever used. 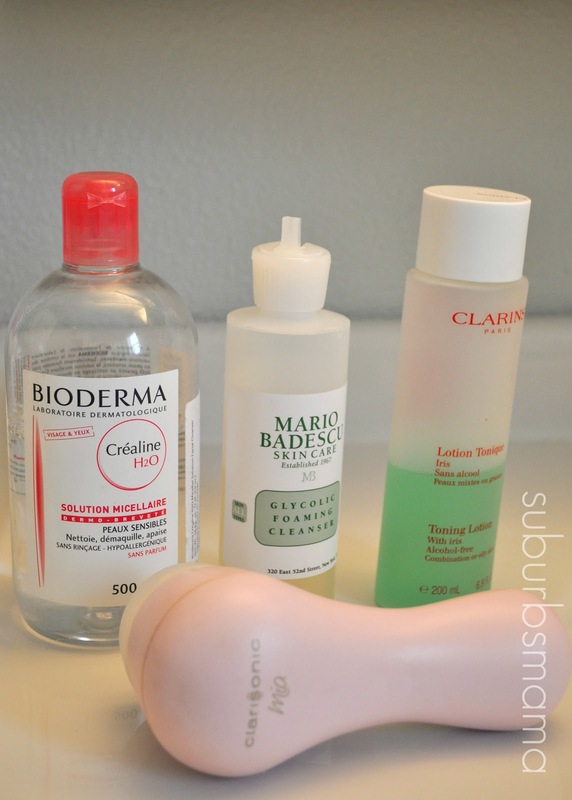 To cleanse face I use Mario Badescu Foaming Cleanser. I use the clarisonic at the end of the day. To moisturize during the day, I use Hope in a jar. I don't love it, but want to use it up, before I try something new. My alltime favorite lip balms are the sprout lip balms.They are all natural and literally melt onto your lips. For nightime I use Neutrogena Ageless essentials night cream. This is a new thing I added recently to my routine, because I am getting older and need something a little moisturizing. I use Mario Badescu Eye cream twice a day. 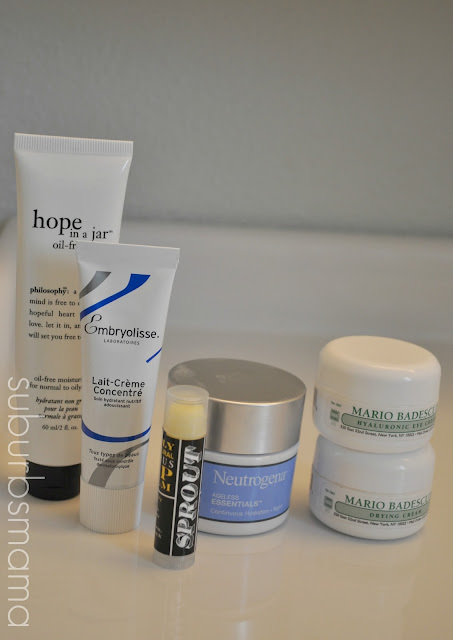 I use the Mario Badescu drying cream whenever I get any hormonal breakouts. If you have similar skin as mine, please let me know what you use and what your favorite products are. Hi Rita, My name is Catalina, and I am from Romania. I follow your posts from some time now, and I have decided to write you only now. Did you know that Mario Badescu is Romanian? I am astonished to see that you use his products! To tell you the truth I did not use them, but if you say they're ok, I believe you, as I have the same skin type as yours! Oily, sensitive, needs hidration and acne prone. I also like to use Bioderma as a make-up remover! But for may oily and sensitive skin I use a miracle oil (that's right! a mixture of 3 oils): http://shop.lia-delicii.ro/cumpara/zona-t-2614475! But I am afraid they do not ship outside Romania, you may try to contact them. Thank you so much for taking the time to leave a comment. I had no idea that Mario Badescu was Romanian. I am afraid that link is in romanian, The miracle oil looks interesting, however you are right, they dont ship to the US, not even on Amazon. I will have to look into it further. I use the clarisonic also. For face creams and mosturizers I use the hsn line serious skincare vitamin A line. It has retinol and stuff. Lol. The only issue i have with it is that my face feels dry (but i think that is from the retinol) so i end up putting on another layer abot five minutes after if not wearing makeup, or I use the primer that is included in the kit before putting on makeup. I also use aveeno vitamin c cream which i really like. Thank you so much for taking the time to comment, Melissa. I have never even heard of the HSN line, I will do some research on it. Thank you again. I use the Neutrogena Ageless moisturizer at night. I'm 29, which some might think is too young for wrinkle cream, but I love the way it moisturizes. I've also just started using the 3 step Clinique acne system. No verdict on it yet. I don't have oily skin but everything else is just like you. Keep up the posts on your products. I always like to know what other people are using. 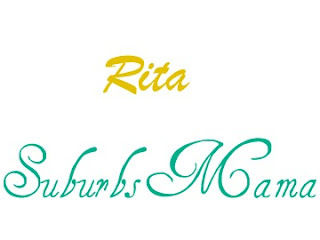 Hi Rita, I found your blog through Pinterest. I recently started using Paula's Choice Skin Balancing line. I also use antibiotics around 'that time of the month' and a retin-a cream, as well as, clyndamiacin prescribed by my Dermatologist. I have very similar skin as what you describe, and this has helped immensely. I also use a Clarisonic, and I LOVE it!